Six years ago, the most beautiful blonde-haired, blue-eyed girl entered our hearts and forever changing our lives. In a matter of moments, I went from being in labor to having an emergency c-section, to becoming a parent. Like most new parents, we felt a huge range of emotions that first day, from total and absolute love and adoration to complete fear. 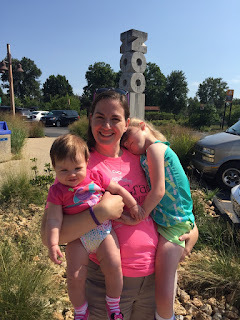 We went from being able to decide for ourselves when we wanted to sleep and eat, to having someone, weighing less than ten pounds, dictate our entires lives. It was a hard adjustment for me at first. Although I always loved babysitting when I was growing up, and loved being around children in general, it was completely different having a child totally reliant on me for everything. I was overwhelmed and just sure I was going to mess everything up. But eventually, we found a routine that worked for us, and even though that routine was constantly changing, we seemed to find a groove as a family and enjoy being together. Birthdays have always been a fun celebration in my family, so as we neared Grace's first birthday, Kyle and I had a lot of fun planning a big Elmo-themed birthday party for our family and friends. We even had a mini party at the nursing home with my Grandpa Phil, who shared Grace's birthday. Even though they only got to celebrate that one birthday together, I know it was one of his favorites. Shortly after Grace's first birthday is when she began to miss milestones. 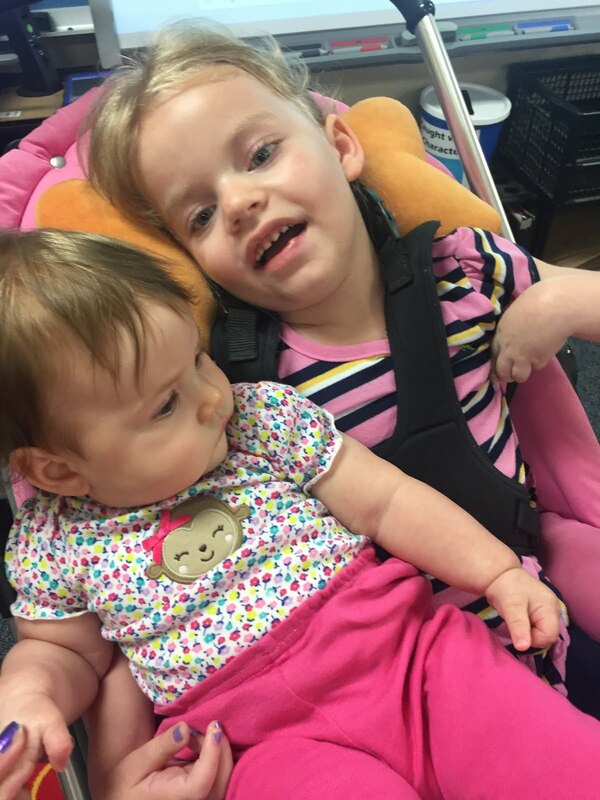 In the beginning, it was easy to think Grace would eventually catch up, and we just worked harder with her in therapy. But catching up just wasn't meant to be for Grace. She continued to miss milestones and even began to lose some of the skills she had. 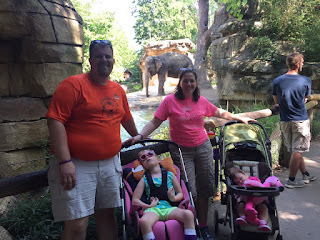 Then, we found out Grace had INAD, and would be lucky to live long enough to celebrate her tenth birthday. That made her sixth birthday a tough one for me. 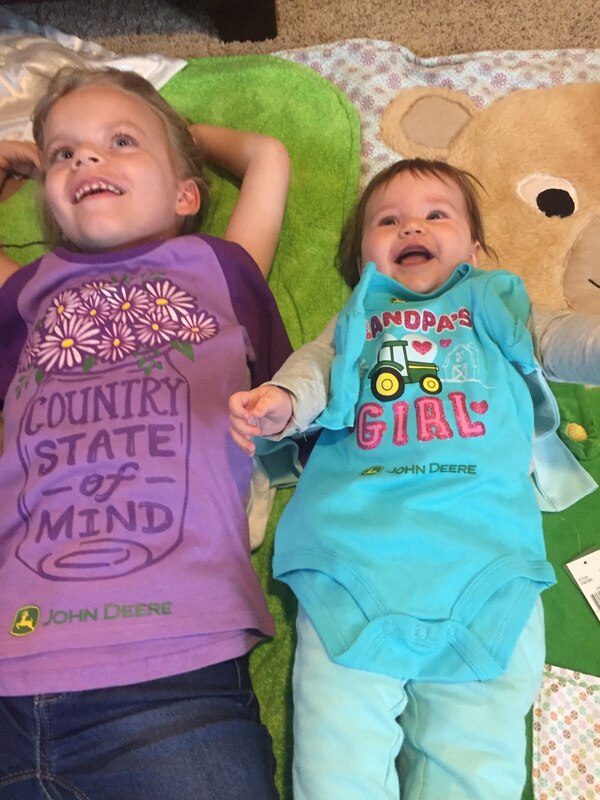 No one should have to think that their child's life is already half over when they turn six. They should be celebrating a bright future full of potential and possibilities, not worrying about increasing medical issues, and just how many birthdays they would have left to celebrate together. Those negative thoughts creep into my mind, and this year, made it hard for me to want to celebrate. I caught myself thinking that Grace wouldn't really know whether or not we had a party. She wouldn't be able to eat the cake or open the presents, and it felt like it was just too much for me. However, with a little encouragement from Kyle, I was reminded that Grace is still here with us, and I wouldn't want to miss any of her birthday celebrations, even if she doesn't get to celebrate as many as I hope for. 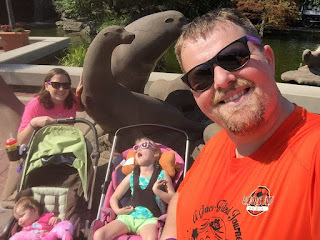 The week before her birthday, Grace's physical therapist was gone on Friday, so Kyle and I decided to take the girls to the St. Louis Zoo as a family celebration for her birthday. 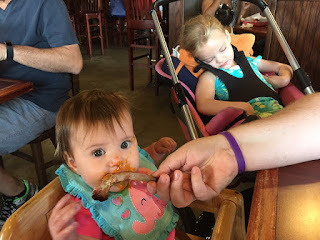 We had lunch at Pappy's Smokehouse first, and Charlotte got to enjoy her first real baby food, although I think she would much rather have had the ribs her daddy was eating. Then, we were off to the zoo. It has always been a special place for us. We took Grace on her first trip to the zoo for my first Mother's Day. And she has always loved being outside and seeing the animals. We aren't sure how much she is able to see anymore, but we know that she enjoy being with us. And we made the most of the beautiful day, taking lots of photos of the girls. Kyle and Charley loved hanging out with the penguins, and I loved seeing the flamingoes. Both girls were sound asleep before we got to the River's Edge to see the elephants and the hippos. All in all, it was a very relaxing, fun day to be together and celebrate Grace. 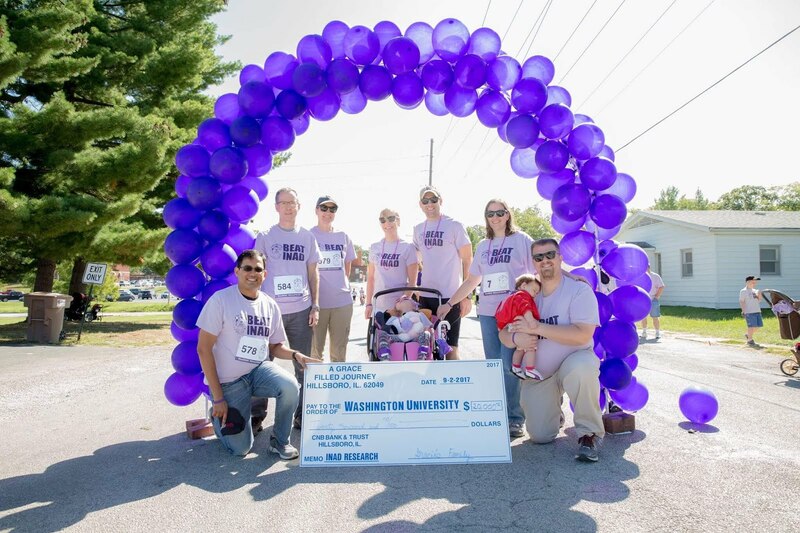 The weekend before her birthday was the Grace Race fundraiser for INAD research, so Grace had the chance to see so many wonderful people, who turned out to help us raise more than $22,000 for the study at Washington University. Each of the kids got a birthday sucker from Grace and a chance to enjoy many of the kids activities. After the race was over, we had cake and ice cream with family and friends who were already in town for the race. Grace was sound asleep from the race, and slept almost the entire way through the festivities, but I enjoyed singing Happy Birthday to her and helping her blow out her candles. I'm sure everyone already knows the wish we made together. And I still hope and pray that it comes true. 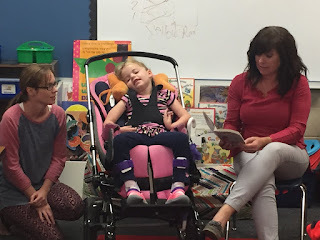 Grace's actual birthday was a school day, so she had a great time celebrating with her friends. It was class picture day too, so we went to school bright and early for photos before returning later in the afternoon. After I dropped Grace off at school, Charley and I walked back up to be part of the school festivities. For her birthday treat, I picked out orange Oreos (since that's Topper colors), and we made treat bags of Play-doh and Sixlets. The kids loved singing Happy Birthday to Grace, and she got to sit right by the teacher when they read Junie B. Jones. Charley and I left when the kids got ready to go out to recess. And as if all that celebrating weren't enough, that night was a Volley for Grace fundraiser night in Morrisonville. 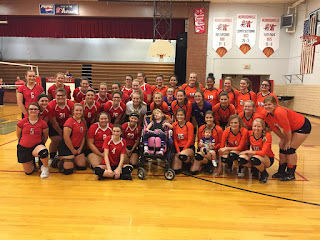 They raised over $200 for INAD research, and even had the entire gym sing Happy Birthday to her. I think she definitely liked all the attention. 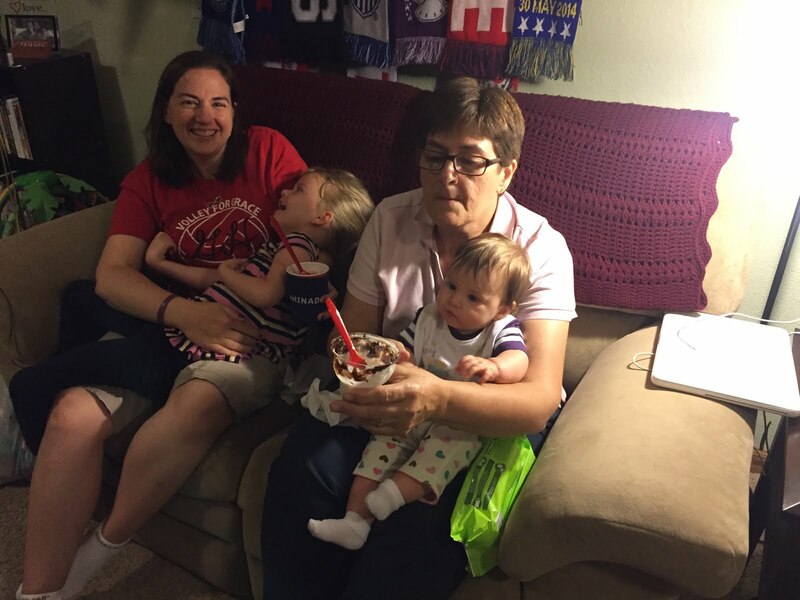 We ended the evening sharing some ice cream with Grandma and Grandpa Galer, who brought over some very popular birthday balloons and helped us ring in another very wonderful year. 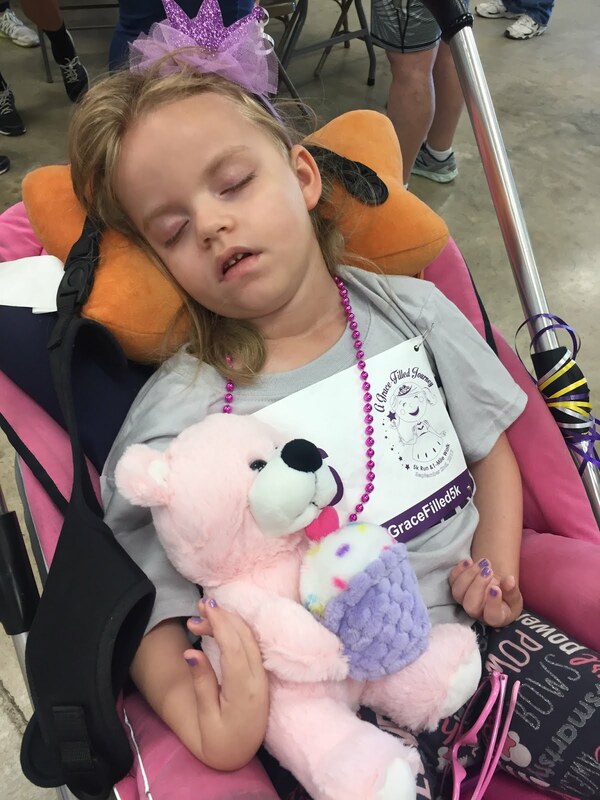 Although I'm sure this year will present a variety of challenges related to Grace's condition, I'm excited for the new adventures they will bring as well. And I plan to cherish each of Grace's birthdays that I'm blessed to spend with her.